On 4th Rabi ul-Akhir 1438H, Syedna Fakhruddin TUS delivered bayaan on the occasion of Milad Imam-uz-Zaman SA. Maulana remarked that tonight is the auspicious night of Milad of Tayyeb Imam, wiladat on 4th Rabi ul-Akhir, like his jadd (forefather) Rasulullah whose Milad is on 12th Rabi ul-Awwal, and they both share the kunyat (honorific title) ‘Abul Qasim’. Even during seclusion, the chain of Imamate continues, from father to son through nass. Quoting Ibn Hani’s qasida, Maulana explained that the Imam is the reason for the existence of the entire Universe, the rising sun gives shahadat (witness) to the presence of Imam-uz-Zaman. Now the reason for the world’s existence, the Imam, has gone into seclusion, but his Dawat remains established, giving witness to the presence of Imam-uz-Zaman, Duat Mutlaqeen establish his Dawat. Maulana did zikr of Maulatena Hurrat al-Maleka, the azeem (great) hujjat of Imam, who received faiz from the Imam, as Amir Imam prepared for satr. Maulana recalled how Qutbuddin Maula would always state that perform shukr and you will lead a life of peace. Maulana recounted an incident that occurred with a Mumin bhai, who maintained a large business at the time and had done khidmat of Dawat. Maulana asked him how was his business, to which he gave a lukewarm response, “thandu che, chale che”. Maulana inquired further that is it going well, to which he replied yes, so Maulana commented that one should say so, Alhamdolillah, perform hamd for the nemats bestowed, even though life in this world is full of difficulties. Maulana also recalled that on a recent tafreeh (sightseeing) trip, he came across a version of the common English saying “glass is half full or half empty”. In this instance, it said, “glass is half full, and the other half tasted delicious”. One should maintain such a positive attitude, not let what others do or say have an impact on one’s self, rather maintain shukr which leads to a life of peace and tranquility. 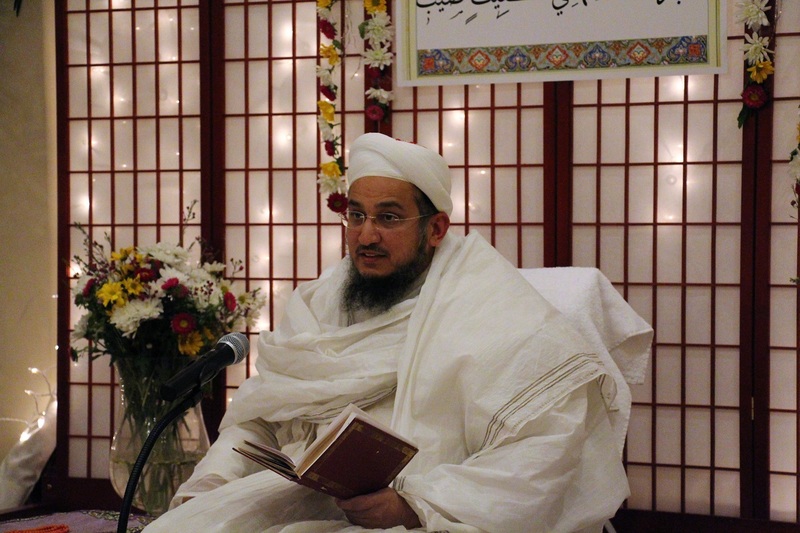 Returning to the zikr about Sijjil-al-Bisharat, Maulana explained how Amir Imam performed shukr, performing shukr is ibadat in and of itself. Amir Imam does shukr for the baland (great) nemat, that of a farzand and then does praise of Tayyeb Imam. Maulana also emphasized on the several indications Amir Imam gave in the letter, regarding the nass towards Tayyeb Imam. Maulana explained how the 3 nukta in “Tayyeb” indicate that during satr, Dawat will remain established through 3 maratib: Dai al-Mutlaq, Mazoon and Mukasir. 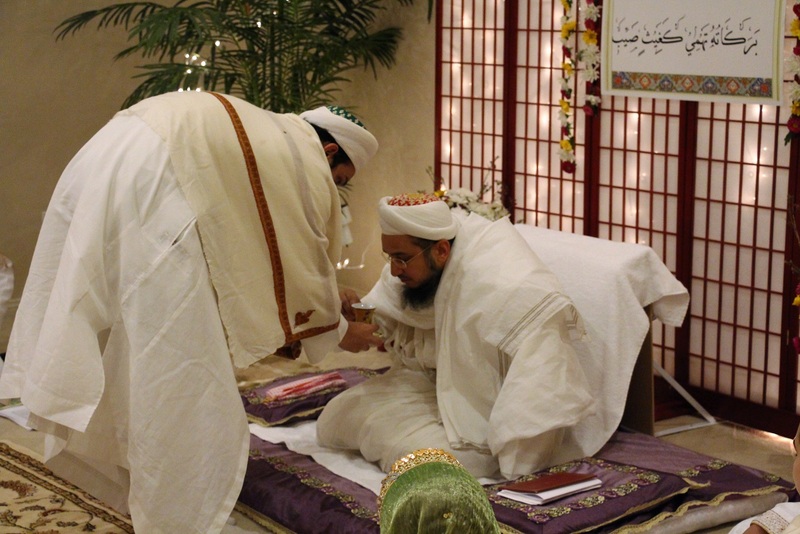 One nukta is separate from the other two; the Dai is unique since he is the representative of the Imam. Maulana then did bayaan on Duat Mutlaqeen, their Dawat is mansub (connected towards) to Tayyeb Imam. The azeemush shaan Duat in Yemen, who authored kitaabo of haqiqat, to prove that Imam is present although in seclusion. Maulana quoted Rasulullah’s hadith that one who dies without recognizing Imam-uz-Zaman has died in jahiliyat. 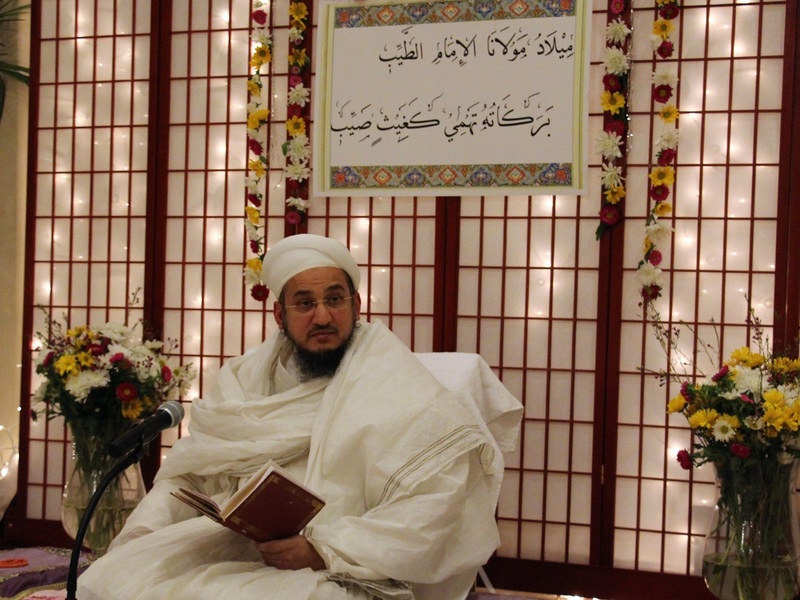 Duat have stated that Imam has been in seclusion for a long time – now 900 years have passed, Imam is still in seclusion yet Dawat remains established. 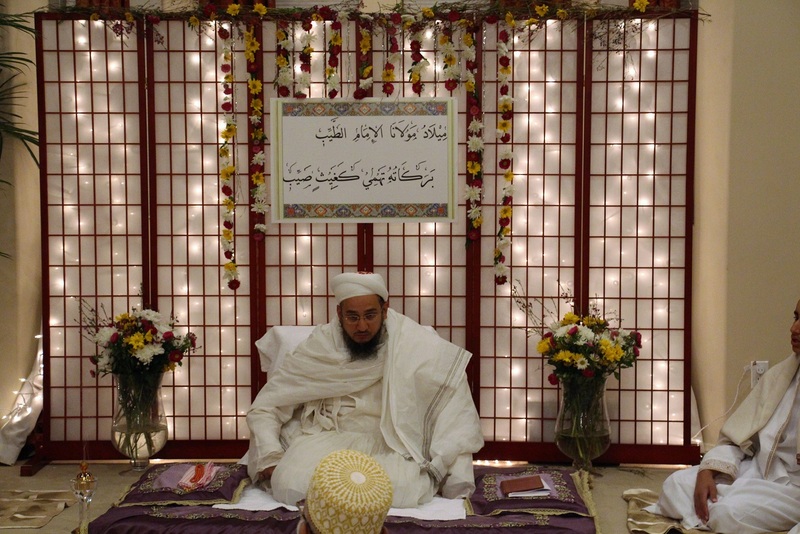 Maulana stated that we have gathered on the night of milad and offer mubarakbadi and tehniyat in Hazrat Tayyibiya. Maulana also gave mubarakbadi to Mumineen, those who had given misaq. Then with great shaan, Maulana expounded in verse-by-verse detail the mana (meaning) of one of Maulana Taher Saifuddin’s qasida in shaan of Imam-uz-Zaman, “Ya Azharan Zaharat Behiz-Zahrau - Wazahat Ala Khadra-e-hal-Ghabrao”. Finally, Maulana Fakhruddin himself did araz to Imam: “I am qurban, fida on you with my father and mother, my life, my wealth, my children. May the roshni of these fuyuz qudsiyyah remain ever flowing. We pray salawat on Imam-uz-Zaman, the sun of aale Muhammad, until the sun continues to shine.” Maulana ended the bayaan on salawat and doa: for nasre azeez and fateh mubeen, for his health and long life in khidmat and fida on Imam-uz-Zaman and Dawat, for Mumineen, for their safekeeping (“ek baal waaqo na thai”) and for their izzat.